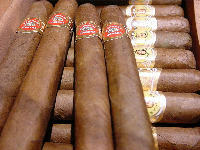 Ask someone else for a light (‘The lighting of a cigar should be a personal affair’). 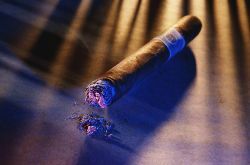 Let the cigar die a dignified death; after it’s smoked halfway, it will go out on its own. The important thing to remember is that we cigar aficionados should present ourselves as considerate and understanding individuals. Changing people’s preconceived notions and giving the growing numbers of aficionados a good name is well worth that little extra effort. Interesting to read the Cigar Etiquette don’ts listed above; particularily, “Don’t hold a cigar between your index and middle finger.” Has young Mitchell looked at his photo on this page and seen his finger grip? 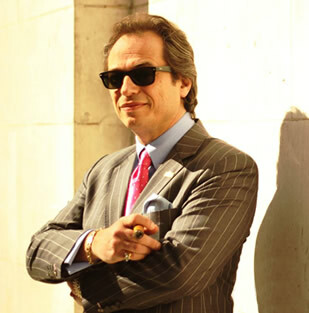 Why never smoke a cigar when walking, I love nothing better than taking my dogs for a walk along the river and enjoying a great cigar! !